Some young warriors have gained confidence in their nautical abilities, while population pressure at home has been building. The open ocean around them beckons to be explored. What new lands might be found? What new empires can be founded! 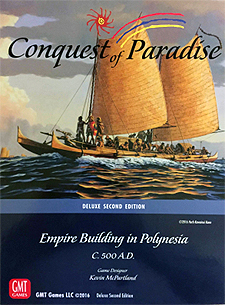 Conquest of Paradise is a well-tested, fast-playing design geared to appeal to player who enjoy games like New World, Civilization, and Conquistador. You can learn the game in 10-15 minutes and finish a complete game in 60-90 minutes.